It's no secret that there are some great, undiscovered gems that reside in the Adelaide Hills. With picturesque views of the South Australian landscape, dreamy driving paths, and an abundance of small, local businesses, visiting the Adelaide Hills always brings with it a sense of community and belonging. One such cafe that has recently captured my attention is the newly renovated Sheoak Cafe, which is located minutes from Belair National Park and iconic looking point Windy Point. Visiting the cafe on a particularly rainy and stormy day, we were welcomed with friendly staff with big smiles on their faces. As we were directed to our table, we were pleasantly surprised by the fireplace - just one of the things that made the cafe feel inviting, welcoming, and cosy. Mismatched furniture and brightly painted walls bring life to the inner (and outer) decor of the cafe. In terms of affordability, the menu might be a bit too pricey for someone who is living on a student budget. However, the drive / commute up to Belair should warrant a day of treating yourself and when you know that you'll be paying for top quality, then it's worth splurging a bit, right? The cafe prides itself in offering locally sourced food and wine, which is the perfect meal to kick back and bask in the gorgeous views of the best of South Australia. The menu also offers all day breakfast and lunch options and caters to dietary requirements upon request. Walking in around the breakfast / brunch rush, my boyfriend and I ordered the Portuguese chicken burger with sweet potato wedges and the small brekkie. 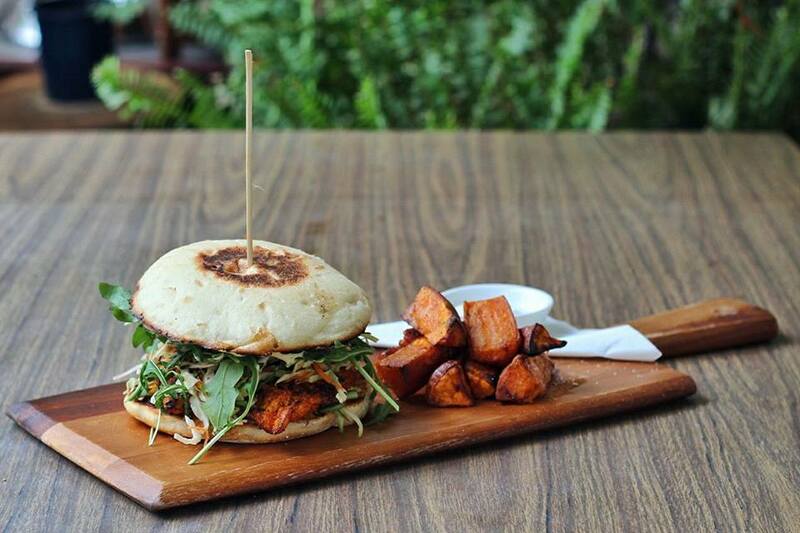 The Portuguese chicken burger was packed with flavours of juicy chicken cooked in the beautiful Portuguese spices and served with fresh greens such as rocket and lettuce. Served with a side of roasted sweet potato wedges, this was a meal that was wholesome and scrumptious. My boyfriend got the small brekkie and despite its deceiving name, it felt equivalent to being a big brekkie. The eggs were poached to perfection, giving it a satisfying break, which made the egg yolk ooze out onto the toasted sourdough bread that it was served on. Decorated with a balsamic glaze and served with bacon rashes, this was a meal that was basically wiped off the plate! Sheoak Cafe's location also makes it a prime spot to host events such as weddings, engagements, 21sts, and birthdays (to name a few), which is brilliant given its excellent location! With a hospitable team of staff members, a fine selection of South Australian wines, an array of items on the menu that are bound to be pleasers to the taste buds, and a beautiful backdrop of the Adelaide Hills, what more could you ask for? Next time you find yourself in or around Belair, make sure you stop by this quaint little cafe and enjoy the good atmosphere accompanying your visit. The bun for the chicken burger looks different. What kind of bread was it, do you know?